Hey everyone! 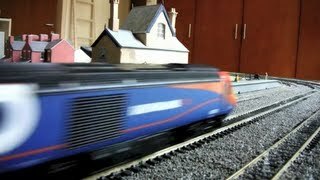 In this video, on my ballasted track, I run a variety of modern trains including passenger and freight trains. These trains look stunning on the ballasted track and also make the sound of a real train because of the ballast. Everything is starting to come together and form a railway. Thank you so much for watching this video and for more videos on my model railway…SUBSCRIBE!